The instruments, which are used to produce an image of an object by using a lens or a combination of lenses, are called optical instruments. Examples are a Photographic camera, microscope, telescope, etc. The construction of camera is based on the principle thatwhen an object is placed beyond 2F of a convex lens. A real, inverted and diminished image is formed between F and 2F on the other side of the lens. A microscope forms highly magnified images of the tiny objects by a system of combined lenses due to which it becomes possible to see the details of very tiny objects through a microscope. An astronomical telescope two convex lenses are used ( one objective and other eye-piece) are fitted at the outer ends of two metal tubes which can slide into one another. The objective of an astronomical telescope has a large focal length but the eye-piece has a short focal length. The instrument, which are used to produce an image of an object by using a lens or a combination of lenses, are called optical instrument. The photographic camera is an optical instrument that is used to record a permanent image of an object on a photographic film. The microscope is an optical instrument that is used to see the details of very small objects which cannot be seen through our naked eyes. The telescope is an optical instrument that is used to see the details of the distant objects. What is the optical instrument? Those instrument which uses lens or mirror and form the images according to requirements are called optical instruments. For examples: camera, microscope, telescope, etc. Mention the type of optical instruments. Real image forming optical instruments - such as the projector and camera. Virtual image forming optical instruments - such as microscope, astronomical telescope. The image formed by these instruments is seen directly by the eyes. How many lenses does a compound microscope have? Write their names. A compound microscope has two lenses. One is called eyepiece and the other is called objective lens. The objective lens has smaller focal length than that of the eyepiece. How does a telescope make far distant objects see clearly? In a telescope, at first the light rays are collected from objective lens. Then it forms the inverted and real image at its focus. The image formed is adjusted such that the image also lies at the focus of the eyepiece. In other words, it must lie at the focus of both the objective lens and the eye lens. Then the eye lens forms magnified image at infinity. Thus, the telescope helps us to see distant object clearly. Write the main uses of telescope and compound microscope. The compound microscopes are used to see small objects in large and magnified form, whereas the telescope is used to see far distant objects. The astronomical telescopes are used to see star, planets, etc. In the space, similarly, the cell, blood or microbes can be seen through the compound microscope. Write down any two differences between compound microscope and astronomical microscope. It is used to observe microscope objects. It is used to see far astronomical objects. In compound microscope, focal length of objective lens is smaller than eye lens. In telescope, focal length of objective lens is long while focal length of eye lens is short. Lenses are kept in such a manner that the image formed by the objective lens falls within the focus of eye lens. Two lens are kept in such a manner that both of the lens should have the same principal focus. The distance between objective lens and the eye lens in a compound microscope does not have to be changed, but it has to be changed in a telescope. Why? The image of an object made by an objective lens in compound microscope lies always in same point. 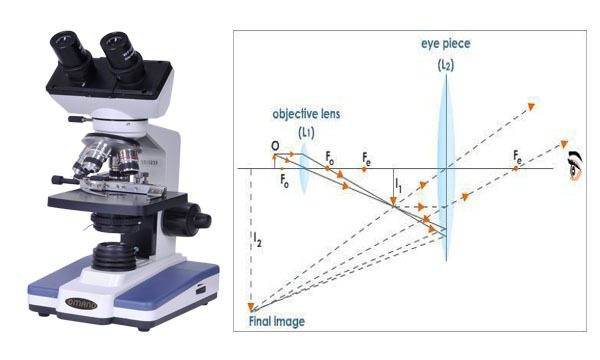 Therefore, in microscope, it is not necessary to change the distance between the objective lens and the eye lens. But while using telescope, the distance of an object is changed. In this way, objective lens forms the image of an object at different distances at different places. Therefore to place the image on the focus, the distance between the objective lens and the eye lens should be changed. Objective lens of telescope is made wider than that of compound microscope. Write with reason. The objective lens of a telescope should collect scattered light rays on the large area to observe the distant object distinctly. Therefore, the objective lens of telescope is made larger than that of compound microscope. Objective lens is bigger in _______. The objective lens of which optical instrument has a large focal length but the eye-piece has a short focal length? A virtual image forming optical instrument wich is used to see the magnified image of a small object placed very closed to it is called ______. Any Questions on 'Microscope and Telescope '?